Horticulture farmer James Kisaame, 50, is one of the okra exporters in Uganda. He has grown the vegetable for the last 20 years and many people in Buwege, Nsuube have nicknamed him Okra since he was the first person to grow the vegetable in the area thus introducing it to the rest of the community. Kisame, who dropped out of school after Senior Four opened a retail shop that helped him pay all his bills. However, in 1999, he was advised by one of his friends to venture into okra, a vegetable he hardly knew about. Doubtful, about its market, on a plot of about 50 by 70 feet, Kisaame decided to try his luck. "I bought my first seeds from a friend who had advised me about the vegetable that was new to me. A kilogramme of seed cost Shs3,000 then," he recalls. Much as his friend had interested him in growing okra, Kisaame had mixed feelings about it, scared about how and where to source the market. Kisame told his friend that he would give the produce to him (friend) in the event that he failed to sell it. Setting his okra garden by the roadside, weeks towards his first harvest, Kisaame was approached by two men who asked if he had enough okra to supply their Belgian market. With the ready market at his disposal, Kisaame convinced his community members to grow okra, an idea many farmers in this area embraced. By buying okra from his fellow farmers, Kisaame met the demand. Today, he owns over three acres of okra, something he says has enabled him constantly supply his clients. "I supply Tropical Dynasty and KK Foods Company twice a week, that is Monday and Friday," he says. Every week Kisaame harvests 80 boxes of okra from one acre. He says a box contains about six kilogrammes of okra. During scarcity, a box of okra is sold between Shs15,000 and Shs17,000. However, when the market is flooded with okra, a box may cost as low Shs5,000 and Shs6,000. Nonetheless, he says the dynamics in the market and the change in seasons have not discouraged him from venturing more in the vegetable. Locally, Kisaame says okra is at a low demand and because not many farmers take caution while growing it because their target is the local market where less attention is paid to the quality and standards of the produce. He adds that the quality and standard of okra is determined from the time you decide to start planting. Before you decide to venture into okra as a business, find out which type is highly demanded and the desired size. When growing okra for commercial benefits, Kisaame says one should work alongside export companies as they will guide you on the required standards. "There are mainly two types of okra that are recommended for the export market; Pussa sawani 1 and Clemson spineless. The other types such as Burgundy and Burmese are for home consumption and are commonly grown in northern Uganda," Kisaame explains. Kisaame says, clemson spineless is strong and resistant to diseases such as root knot nematode which affects many vegetables and crops. They are light green in colour, big and longer in size with hairs around the pods. During harvest, they can easily be picked by hand. This type of produce is common at the local market. Nonetheless, he notes that it can also be exported depending on the export agency you are dealing with. The pods are hairless and the plant is fairly tolerant to yellow vein mosaic disease. Its pods are long, ribbed, smooth, dark green and slender. They are known for high yields thus making them the most preferable for the export market. Having known the two recommended types, Kisaame urges farmers interested in growing for export to check with the export company first about the target audience since it determines which type to grow, how much you need to produce and the time frame. "Okra grows best when planted in an open space without any shade. It also requires well- drained soils therefore opting for water-logged areas would be a better option for anyone interested," Kisaame advises, "Soak the seeds in lukewarm water to help them soften thus easing germination." He says okra can grow up to eight feet tall and beyond. Okra can be attacked by pests and diseases like silver leaf whitefly, rough bollworm, looper caterpillars and green vegetable bugs. Aphids and mites may also occur on okra crops but this does not mean that you apply any pesticide that comes your way. Kisaame says for all the foods or vegetables for export, the type of chemical used to spray is important. For optimal results you will need to use the right pesticides. He says there are recommended pesticides and amounts to be used. "When you use the wrong pesticide or exceed the recommended quantity then your exports will be considered to be of poor quality," he said. In this case, Kisaame says there are two recommended types of pesticides, cypermethin and dudu cypher. "After three weeks of planting, okra can be sprayed using any of the two pesticides. As the vegetable grows you can reduce the time to two weeks, alternating between dudu cypher for one week and cypermethin the other week. Away from the pesticides, Kisaame says okra can also be affected by the weather. "When the weather is cloudy, okra tends to develop black heads thus affecting its quality. In that case, use Tata master and Winner spraying every after four days," he shares. However, he says, during training, they were advised by the laboratory technicians not to apply Rocket and Tafgor on okra because the chemicals have been classified poisonous at the world market. 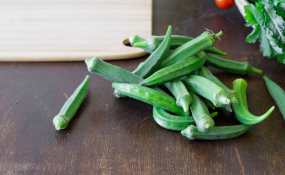 Vegetables such as okra are delicate and need to be handled with care. "It is harvested after 45 days and is best harvested at around 9am when the morning dew is dry. When harvested with dew on it there are high chances of it rotting or wilting before reaching its destination," Kisaame advises. Okra's main enemy is cold, it will be sluggish and may wilt if conditions are too cold thus picking soon as the harvest season starts. Okra is fairly tough but some pests can affect it. One pest that affects many plants including okra is root knot nematodes. This is a small worm-like creature that thrives in warm soil and to control this, he says do not plant your okra in the same spot every year. Instead, rotate the okra bed to avoid a build-up of the nematode population and avoid areas that have had plants that are susceptible to the nematode such as peppers, potatoes, sunflowers.